There's a new Samsung Galaxy Fold video demoing the forthcoming foldable phone going through a torture test less than one month from the official release date. Samsung's 30-second official video shows the phone being folded and folded by sophisticated machines, and there's no crease is in sight on the Infinity Flex Display. 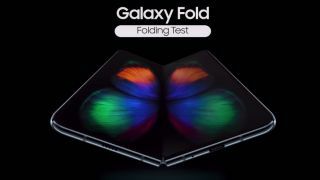 The Galaxy Fold can outlast 200,000 folds and unfolds, according to Samsung, which is enough for five years of heavy use – if folded 100 times each day. Samsung Galaxy Fold has a 7.3-inch mini tablet-sized screen that folds in half inward. On the outside, there's a 4.6-inch display, giving you a one-hand-friendly phone. Interestingly, Samsung says that this folding test takes a week to complete and is 'overkill to some'. But the device's hinge does introduce new moving parts. In fact, durability has been the biggest hangup to the introduction of foldable phones, according to multiple industry sources we've talked to in the past. The Galaxy Fold promises to stay resilient. Has Samsung solved the biggest problem with foldable phone tech, or will that be the Huawei Mate X? We'll know on April 26.